If you’re a homeowner, chances are, the search for ways to save money on your energy bills never ends. As we’re sure you’re well aware, the highest cost on most people’s energy bills is heating and cooling. We know that New Jersey can get really hot sometimes sometimes even getting to the point where we’re under an excessive heat warning like we were a couple weeks ago. It’s during these times that we need our air conditioners the most. But at the same time, we don’t want to break the bank. In this blog, we’re going to go over a couple things you can do to lower your cooling costs this summer. 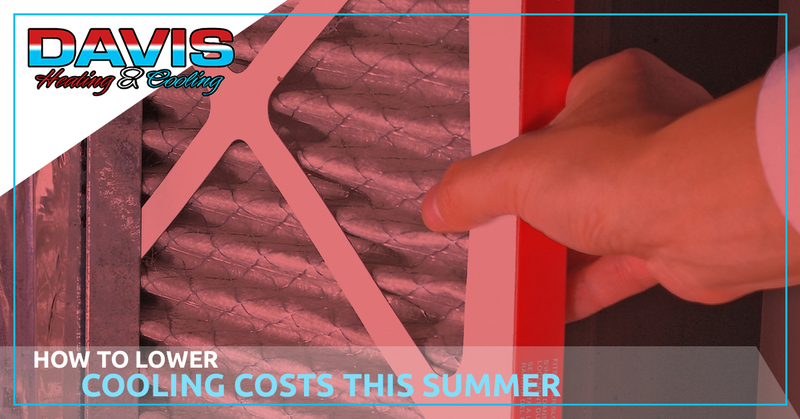 Replacing the air filter on your HVAC system should always be the first step in reducing energy bills. Not only does your air filter remove dust, grime, and other airborne allergens from your home’s air, it also keeps your HVAC system running smoothly and efficiently. According to The Environmental Protection Agency, replacing a dirty can reduce energy bills by around 15 percent. Even if your window looks like it’s doing its job, you could be losing a lot of cool air due to poorly installed, sealed, or broken windows. If you suspect this is the case, be sure you have a home inspection done on your home to see if there are any problematic areas. If so, speak with a window specialist about getting them replaced. What better way to ensure your HVAC system is doing its job than to simply make sure all of your vents are open and aren’t clogged with dust or other debris? Along with replacing your air filter, this is a simple trick that could save you hundreds on your energy bills. Davis Heating & Cooling is your top HVAC company in Flemington, New Jersey, and the surrounding areas. We are proud to provide each of our clients with the services they need to significantly reduce their energy bills each year when summer comes around, even on the hottest days of the year. We offer air conditioning replacement, repairs, installation, and regular maintenance so that you can be comfortable all year along without breaking the bank and without dealing with inexperienced HVAC technicians. Give us a call today or visit our site to learn more about our HVAC services.